Can I make a confession? Ever since my two daughters were little, I dreamt of them playing soccer. After all, the U.S. women’s team was awesome and won many Olympic medals and even the coveted World Cup. With my years of playing experience and the fact that my wife is from Germany (a soccer superpower), it seemed natural that my girls would rule the field. But they had other plans! They fell in love with volleyball. Both of my daughters play club volleyball and for their schools. This has provided me with ample time to see what this sport is all about. 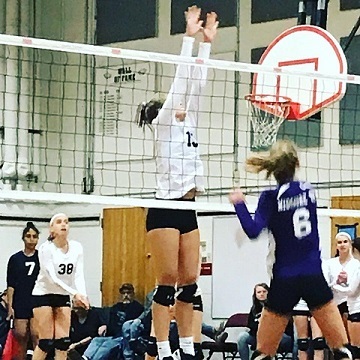 With incredible pace and action in every match, plus kills, blocks, and the occasional pancake, the sport has converted me into a proud volleyball dad! As a doctor of chiropractic, I became very interested in providing care for my daughters that keeps them performing at their best and injury-free. Chiropractic offers a comprehensive approach to sports injuries, including the many types seen in volleyball. The array of techniques used in chiropractic can profoundly benefit the player and mitigate the effects the game has on the body. From gentle adjusting (realigning) the bones of the spine and extremities to soft tissue and laser techniques on the muscles, ligaments, and tendons, chiropractic can help keep your child (or you) in the match, get them back on the court, and even help improve performance. Over the years, chiropractic care has become an essential component leading to the success of many professional sports teams (such as the Eagles, Phillies, 76ers, and Flyers), Olympians (including the U.S. Women’s and Men’s Volleyball Team) and serious amateurs. The value of chiropractic can be best demonstrated with the appointment of the chiropractor, Dr. William Moreau, as managing director of sports medicine for the United States Olympic Committee (USOC) and chief medical officer for Team USA at the Rio 2016 Olympic Games. After six weeks, the chiropractic group had an overall 10.7 percent improvement in athletic ability. The control group had a 4.5 percent improvement. I have found working with volleyball players to be very exciting. They are passionate, competitive, and always grateful for care that helps them excel and get and stay well. Like all sports, volleyball produces a wide variety of injuries. I find that the most common involve the lower back, knees, ankles, shoulders and wrists. Often times the underlying causes are elusive. For example, many knee problems stem from issues in the pelvis that lead to inflexibility. Loss of pelvic motion transfers abnormal demands on the knee and ultimately results in a breakdown- even when no symptoms are felt in the pelvic region. Many shoulder, elbow or wrist problems are produced when the athlete’s neck is out of proper spinal alignment. Overall, keeping the volleyball player in top form requires a head-to-toe approach. I have developed a system of analysis that looks to find all imbalances, especially those without obvious warning signs or symptoms (that can secretly crush one’s level of performance). This includes evaluating each part of the spine, upper extremities (hands to shoulders), and lower extremities (feet to hips) for misalignment and fixation. Muscle weaknesses are uncovered and corrected with laser techniques taught to me by Olympic and Tour de France chiropractor, Dr. Jeff Spencer (referred to by the athletes as, “The Sage, Secret Weapon” or “Dr. Magic”). Additionally, tensions and restrictions are released in the Fascia (densely woven connective tissue that covers every muscle, bone and other body parts). Although the spinal alignment may be the most important factor, all must be considered and the approach integrative in order to help an athlete reach her full potential. When is the best time to have a chiropractic evaluation? Considering the performance and injury-prevention benefits, I recommend the same approach used by Olympians and professionals. It’s best to be tuned up regularly and not wait for an injury or pain to occur. If pain or tightness exists or if play is off, I would urge scheduling as soon as possible. Considering the countless hours sitting on bleachers, I also recommend that all volleyball spectators be checked! I welcome questions and am happy to chat in the office, over the phone, or courtside. Volleyball is a thrilling sport for both players and observers. It requires great physical ability and puts tremendous demand on all parts of the body. With a comprehensive chiropractic approach, athletes can excel on the court, and prevent or overcome injuries faster. I am excited to do my part in helping elevate the play in our region and wish everyone a healthy and successful club season.